Align sales territories, assess staff performance and gain insight on healthcare provision using spatial analytics to analyze, optimize and predict. Optimize your field sales performance by designing and balancing your territories using your CRM data. Win bigger and better deals faster, boost sales rep productivity and reduce your field's operational costs through location. Companies with large field sales or service operations often struggle to get maximum value from their CRM. The location data about prospects and existing clients is often ignored, making territory management a difficult task for sales leaders. CARTO SalesQuest allows sales leaders to explore their CRM data and manage their territories more efficiently, moving away from traditional geographical boundaries to customized territories that align with their go-to-market strategy. We wanted to understand the spread of a series of diseases in Brazil, using Open Data around reported cases and level of education. 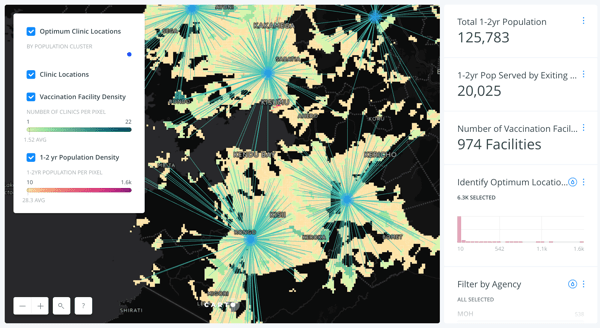 CARTO Builder made it simple to identify high risk areas in Brazil using spatial analytics - creating a location-based index of healthcare factors throughout the region. Spatially analyze the social and environmental factors that affect health and apply those insights to proactively provide preventive services to underserved individuals. Unlock insights on your organization’s performance across spatial dimensions. 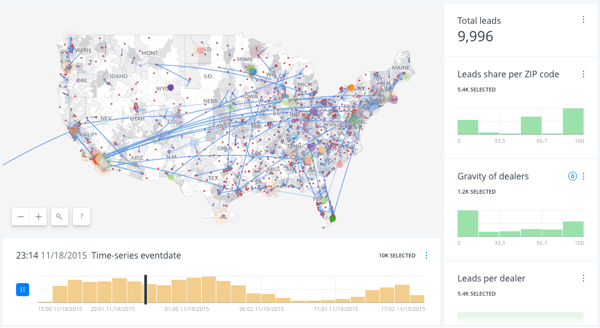 Whether it’s sales rep efficiency or point of sale productivity, Location Intelligence provides a unique opportunity to bring greater context to your existing performance management systems and define actionable insights which shift your teams into fifth gear. This leading B2C brand wanted to understand where they generate leads per territory across the United States. CARTO Builder allowed them to visualize their internal sales data at a national level throughout 2015, using our time series functionality and intuitive widgets. UNICEF wanted to use a range of internal and external datasets to identify optimal locations for vaccination centres in Kenya. CARTO's Builder product made it simple for UNICEF to manipulate existing location data insights and external demographic data geospatially, identifying a series of high-impact locations for their vaccination programmes. For healthcare service providers to bring maximum value, Location Intelligence is crucial. CARTO allows you to bring context to mobility, socioeconomic and demographic data - unlocking insights which allow you to make the right decisions on opening, closing, repurposing or relocating sites.